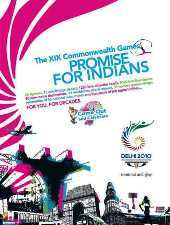 The official website of the 19th Commonwealth Games, cwgdelhi2010.org, now gets seven-eight million page views (hits) every day, with the results page getting half a million more. On October 1, there were only 50,000-odd visitors on the site and the Commonwealth Games Organizing Committee says the traffic has been tripling every day. "The website is getting traffic in huge numbers. The athletics events begin tomorrow and the numbers will jump," said an official from the technology team of the OC. The Games started on October 3 and will go on till the 14th. "We expect the website traffic to near its peak in another two days, while the real peak will be seen on October 10-11. "After this, we expect the traffic volumes on the website to fall, as events will start getting over," he added. Fifa.com recorded 150 million users during the 31-day tournament and a whopping seven billion page views, 1.5 billion more than even Fifa had expected. The site of the Turin Games Organising Committee, torino2006.org, registered 700 million page views, and the site of the International Olympic Committee, Olympic.org, about 32 million. many page views by having advertisements on the website. "Such monetising through ads involves a lot of litigation and, besides, we just want to give information through the website and not earn money from it," explained the official. Analysts reason that footfall euphoria is different from that for the CWG. "Our estimates say that monetising could have got revenue of anywhere between Rs 70 lakh (Rs 7 million) and Rs 1.5 crore (Rs 15 million) over the 15 days of the games," said Mrutyunjay Mishra, co-founder of JuxtConsult, an online research consultancy. However, despite the website getting so many visitors every day, it remains slow in giving updates on the results. On Tuesday, India's medal tally was stuck on two gold, which the shooters had won by noon. The three gold medals won by the wrestlers in the evening session was not reflected on the Games website till late night. Today, the website failed to give the current updates of the results and medal tally. Even an hour after India's Rajender Kumar won gold in the 55 kg category in Greco-Roman style wrestling, the website still showed the participants of the competition and not the results.